BB Lightpipe introduces the BB Parklight as a cost efficient solution for parking areas. The BB Parklight is a modulair lighting system made of a polycarbonate tube (100mm) with integrated LED strips and LED driver. De LED strip emits light directly down to illuminate the floor surface. With a reflector the beaming angle is fixed. The reflector is used to create a wide beam of light, resulting in a average light level of 75 lux over the full width of the driveway with parking spaces. Because of the specific light distribution a single light line is sufficient to illuminate the whole width of the parking (up to 16m). The BB Parklight can be mounted stand-alone but can also be used to create continues or interrupted light lines. In the fixture through-wiring is standard. The fixtures are mounted with easy to mount 'click in' brackets. 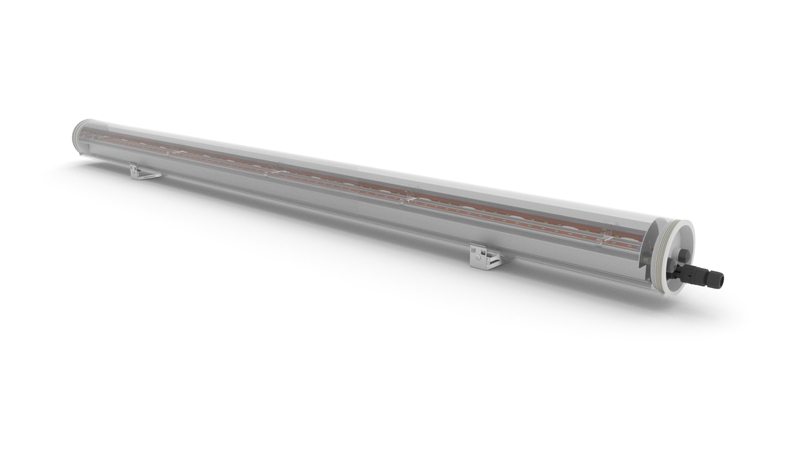 A continues line is easily mounted and installed with the plug and play connectors. If required an additional cover hides the cable between the fixtures. The BB Parklight is DALI controlled. This way an advanced lighting control can be used to dim the fixture. In parkings this can lead to high energy savings by making us of motion of light sensors.